It’s been a long journey with many long hours of creativity, preparations, makeup and production. Starting with the Grootesque makeup, to some degree inspired by the awesome movie Guardians of the galaxy and the character Groot. 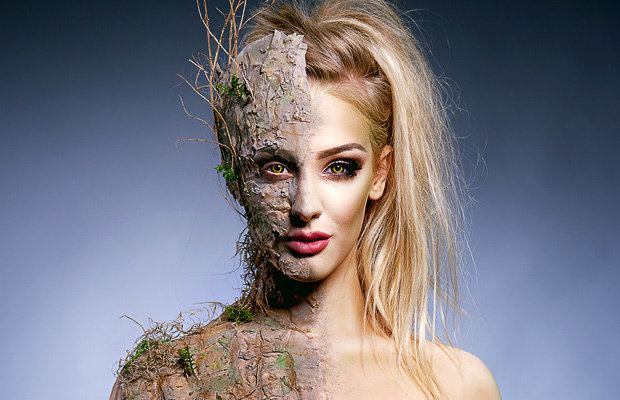 The great mix of organic nature elements and beauty brought Elli into the first ever NYX Nordic Face Awards. The Top 30 challenge was all about nordic myths and tales. With such a rich flora of inspiration in the history and mythology of the nordic countries Elli decided to bring back the deep sea dwelling creature – the Kraken. For the Kraken look Elli incorporated a gelatin and wire construction to create truly awesome tentacles and suction cups. To bring back some of the fear of the Kraken myth she also made spikes using the revolutionary Ellimorph Plastic and wire. 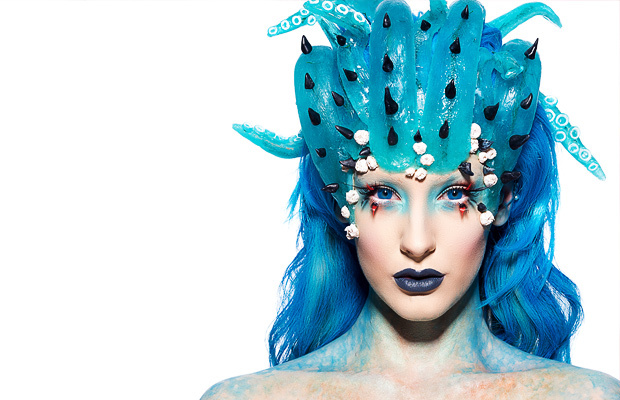 With spiky tentacles, barnacles and a gorgeous, colourful beauty makeup to bring it all together the Kraken look came out superb and brought Elli to the Top 15 in the contest. The top 15 challenge in the NYX Nordic Face Awards now turned its attention to street art with a graffiti theme. Though it may seem like an easy theme at first, it actually turned out to be one of the toughest ones in the contest. Too bring some action to the look, and to keep it from becoming too flat, Elli created a super cool skeleton mask piece with spikes and recycled jewelry. To get a real rough and worn down texture on the graffiti she went on to use water colours to write the text ELLIMACS on her chest, using a cardboard cutout in classic graffiti lettering. When the water colours dry on the skin it tends to crack up and break appart a little, just like old paint on a wall. This detail added an extra dimension to the splashing colour bomb of a look. The voice of the people was heard as the audience voted Elli’s graffiti look into the Top 5 finals! Thank YOU for that! In the final Top 5 challenge all contestants were to create a look on the theme Drop Dead Gorgeous and be inspired by the Aztec indians day of the dead celebrations. As expected this theme needed a great headpiece and once again Elli turned to recycling old jewelry to create a beautiful crown as well as a chin piece to get the Aztec element in the look. Further on things got a bit more unexpected as Elli chose the path of body paint instead of her usual SFX creations. With a really hard skull shading that turns into a full chest skeleton ripping through the skin with a painted 3D-effect, this look came out amazing. The added colour POW on the eyes complements the head piece and the complete look can really be seen as a true Elli masterpiece. 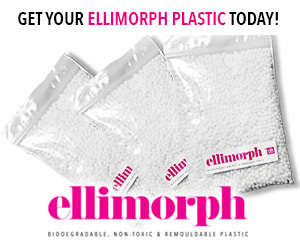 So, now we’re here – Elli has won the first ever NYX Nordic Face Awards and become the Beauty Vlogger Of The Year. Such an awesome accomplishment, and one that could not have been made possible without you – our devoted followers and supporters. So from team ellimacs a huge thank you for being a part of this and cheering us on! 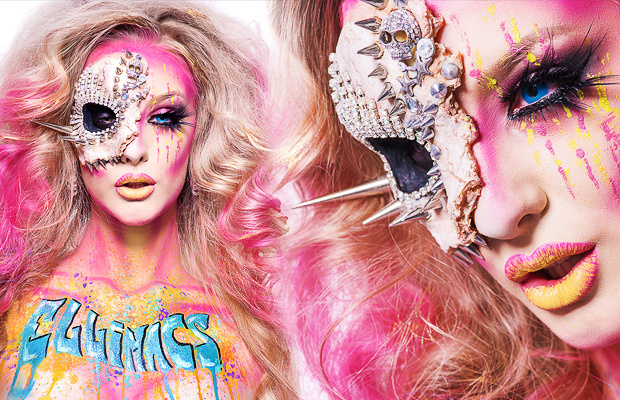 And of course congratulations to all the other contestants and artist for making it into the NYX Nordic Face awards. Such a great effort by everyone. Thank you all and thank you NYX for this amazing opportunity!